Build Your Own Delta Comfort Trike. 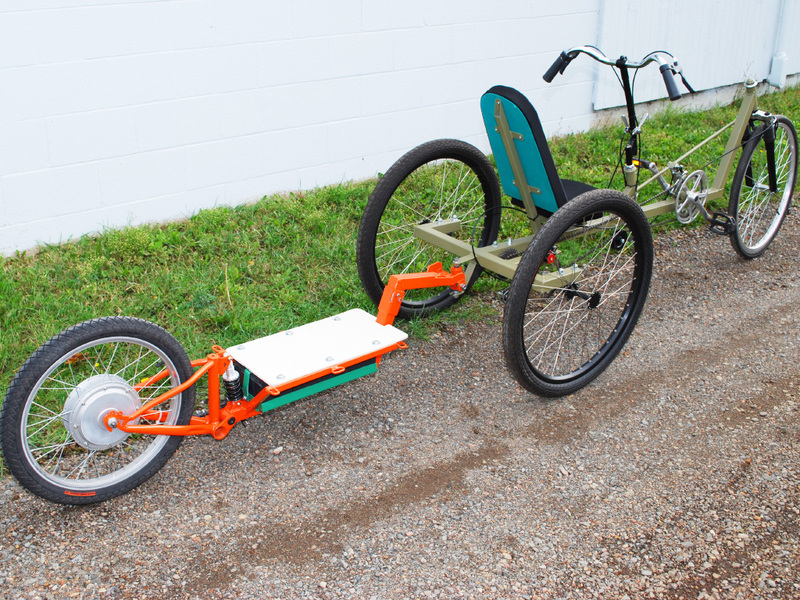 The DeltaRunner Recumbent Trike merges comfort, handling, and style into one great looking DIY vehicle that you can build yourself on a limited budget. Over seat steering puts all of your controls on your handlebars, and allows you to ride in a position similar to a car. The DelaRunner is a great handling trike with front suspension, and a small turning circle, making it the perfect vehicle for city riding or commuting to work. Everything is hand built using basic tools, using mainly bicucle parts and a few feet of square tubing. You can build your own great looking DIY Delta Trike in a few weekends, even if you are new to the DIY bike building hobby. 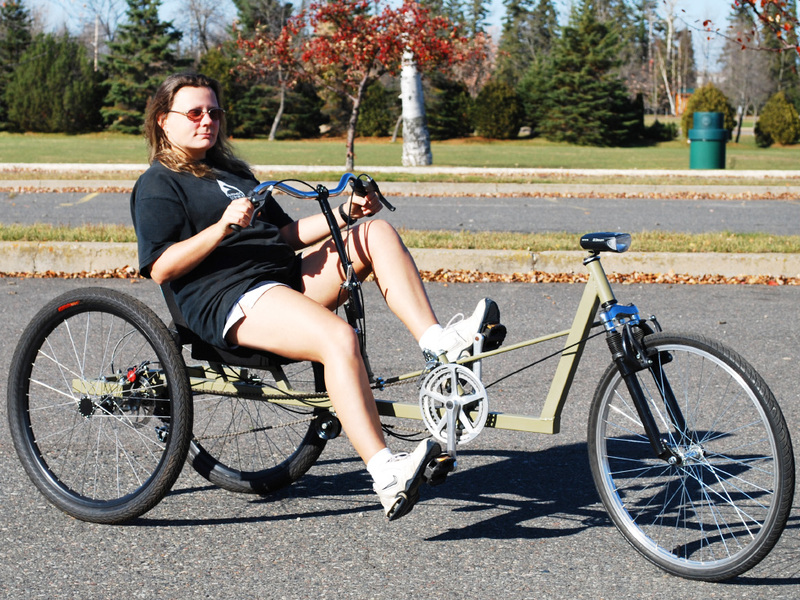 We design our plans so that anyone with a desire to build can make their own great riding Delta Trike. Every single step of the build is shown in great detail, using many clear and concise photos and descriptions from start to finish. The transmission components are all taken from a standard bicycle, so you can salvage what you need or purchase new parts from any bicuycle shop. The frame is a basic straight boom design made from square steel tubing, so it is both easy to cut and to weld. Even the seat is made from scratch using basic materials such as plywood, foam, and a fabric covering. The Upright Stance Makes This a Greaty City Trike. For driving in traffic, you will be sitting at eye level with most vehicles, easily visible on crowded city streets. There is plenty of room behind the seat to add some type of cargo capacity, such as a box to carry groceries, or even a power assist motor. The front suspension and thick padded seat will take up any bumps in the road with easy, so you can ride on pitted city streets, or rouch country gravel roads in pure comfort. Most of the transmission components can be taken from a single bicycle, only needing slight modifications for use on a delta trike. 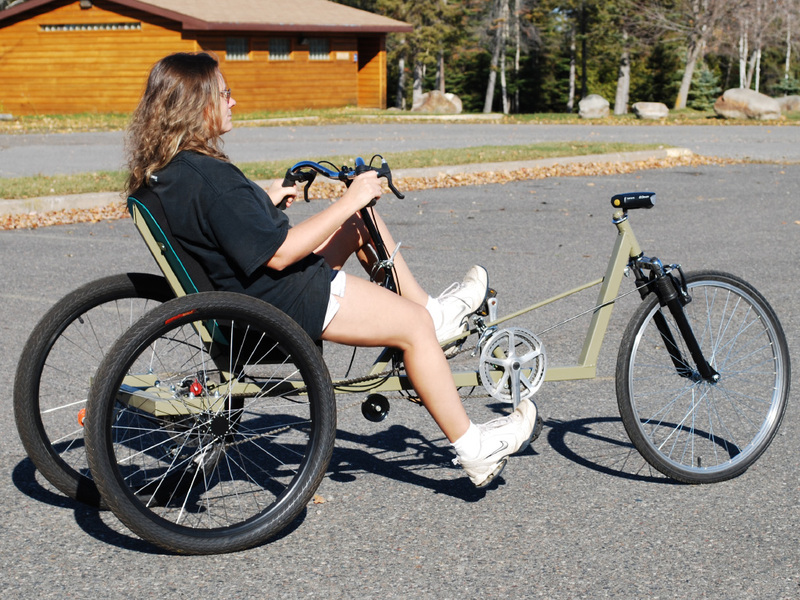 You can add as many gears as any bicycle to give your trike both speed and hill climbing ability. 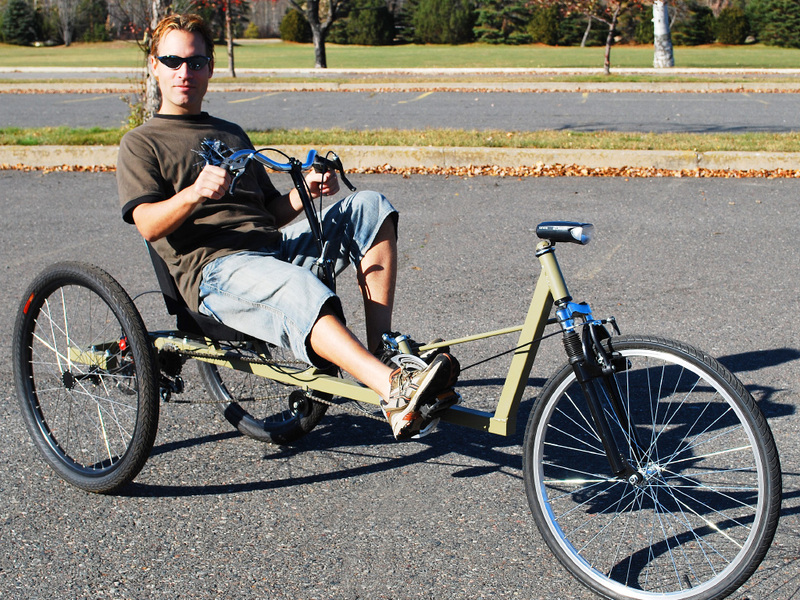 Ride Long Distances on Your DIY Delta Trike. Nobody enjoys long distance riding on a tiny upright bicycle seat! You will not have to endure any of that pain on this trike, as it was made to be as comfortable as your office chair. You are free to add whatever style and shape of seat you like, from the simple foam pad seat shown in the plans, to an actual car seat. The recumbent position also allows you to push hard on the cranks when you feel like speeding up or when you have a long steep hill to tackle. The steering is linked using simple components that can be purchased at the hardware store, and the handle bars are standard bicycle parts used as is or modified to suit your needs. 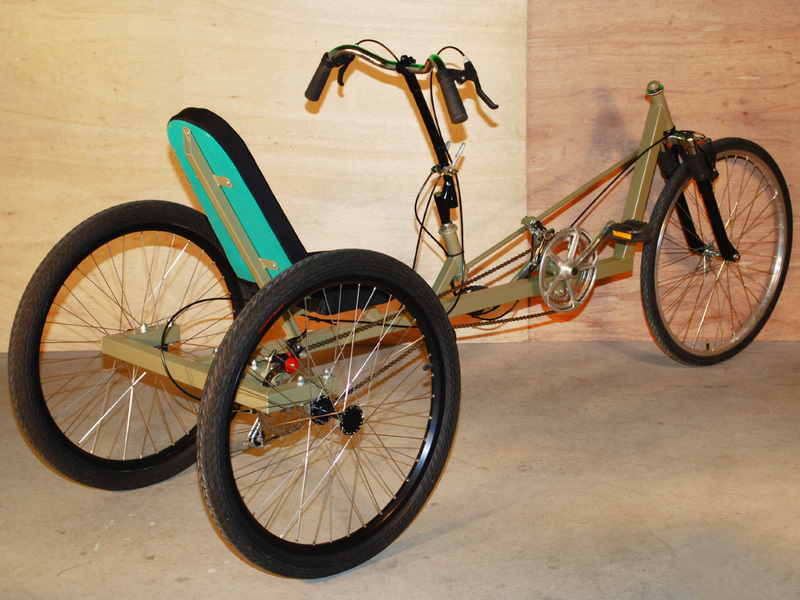 This trike can be made by anyone. Add a Trailer and Leave The Car Parked at Home. The DeltaRunner is a great trike for pulling a trailer. 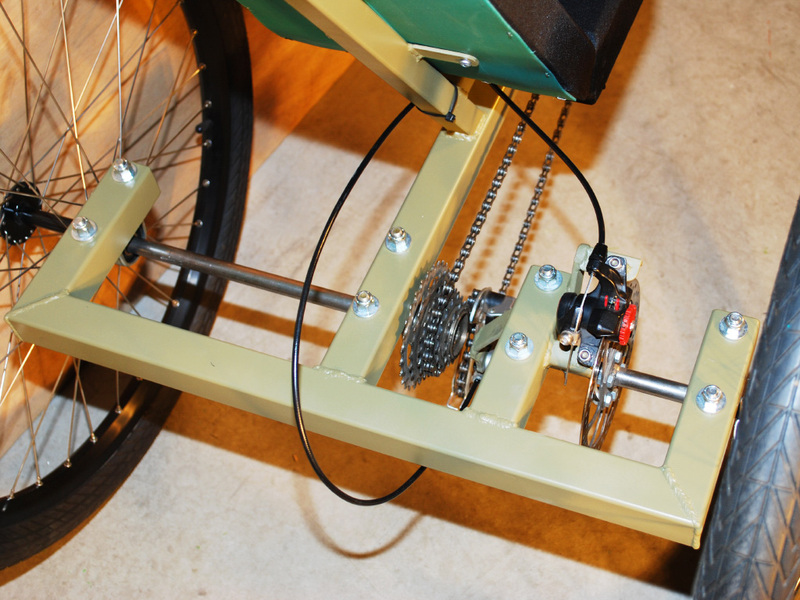 Shown here is our CycleBully DIY electric power trailer added to a simple hitch that you can make. You will save a lot of money on both your fuel costs as well as a gym membership by choosing human power over gas power more often. You could also modify the length of the rear frame, and add a large cargo boc behind the seat to turn this trike into a capable cargo trike. Step by step, this DIY Trike Plan will lead you through the build process, and it will do so assuming that this is your first time building a bike. Once you build your first human powered vehicle, you will have a new skill that will open up many more possibilities. Standard Bicycle Drive System and Disc Brake. 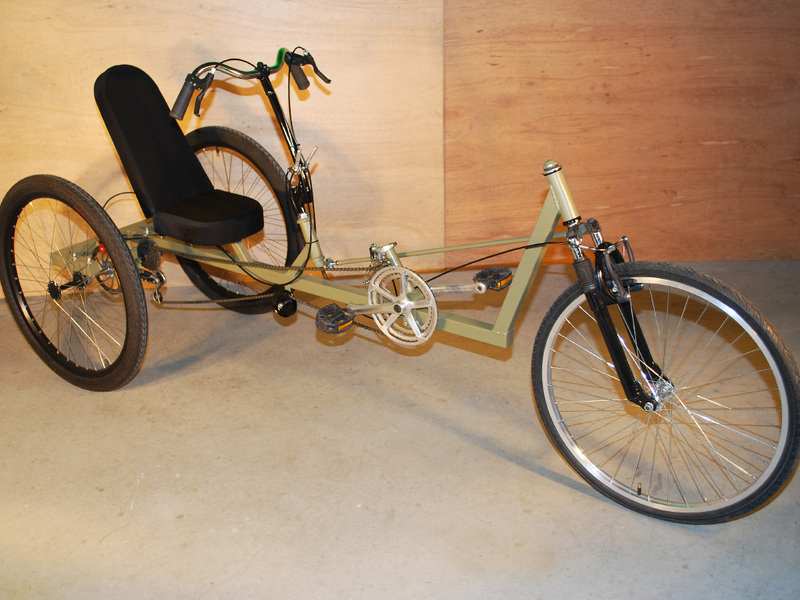 You can add one more disc brakes to this trike as well as a front brake using off the shelf bicycle components. The only machined part is a small threaded adapter to fasten the rear sprocket to the axle, and it is easily made by any shop or garage hacker with a basic lathe. The accessable rear axle allows for easy mounting of a sprocket or belt drive so you can experiment with gas or electric power assist motors. 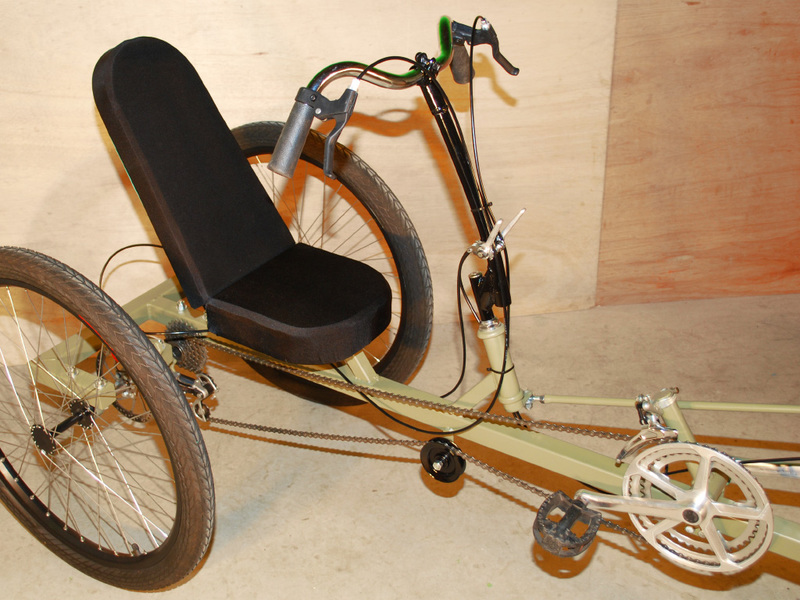 Your comfortable recumbent trike seat can be easily made using plywood, foam, and covering, or it could be something more eleaborate such as an off the shelf recumbent seat or even a converted office chair or car seat. You Have a Full Range of Gears For Hill Climbing. Trikes cannot fall over, so they make for easy hill climbing. Just shift into low gear, and tackle that hill at your own pace. Since the entire trike drive system is made from parts taken off a bicycle, you can have as many gears as you are used to, including a super low climbing gear. This trike is good at moving quickly as well, and has very stable steering at high speed, so you can have fun blasting down those long hills after the climb. Even the rear hubs are easily made using nothing but a drill and an angle grinder, so you can really build this great looking trike on a minimal budget. If you leave your SUV at home more, than it actually saves you money to build your own DIY trike. Ride Off Road or During The Winter Months. You won't fall over on a stable delta trike, so you can enjoy riding on any type of surface from loose gravel trails to icy winter roads. For daily commutes, there is plenty of room to add a front fairing, windshield, or even expore making a fully enclosed velomobile for all weather riding. Put your organic engine to work, and enjoy the view on your comfortable and sporty DIY Delta Trike. Our DIY Trike Plan will even show you how to lace up your own rear wheels, a fun task that is both rewarding and quite easy to do. Nothing beats the satisfaction of rolling out of your workshop on something you built from scratch.